From 7th to 16th December the Richmond Shakespeare Society stages this evergreen Xmas classic right on the doorstep at the eggscellent Mary Wallace Theatre beside the Thames at Twickenham, and so the youngest fans don’t miss their bedtime, there’ll be two Saturday matinees, not one. Remember the Fancy a Good Sing article? Well, despite being short a few tenors – hint, hint – the recently formed choir are ready for a Christmas concert at Richmond College. The PTAs at St Stephens Junior School and Orleans Infant School have joined forces to produce a cookery book to raise funds for their schools. Comprising 65 recipes from parents, governors and teachers at the schools, Come and Get It is lavishly illustrated with children’s drawings and is published on Friday December 1st. Sadly there will be no Christmas Fair in Crown Road this year. The St Margarets Traders Association, who normally organises the event, has decided to take a year off from hosting the event. The fair is an enormous amount of work for the Traders Association and requires coordination with the traders, local school PTAs, Richmond Council, Met Police, fun fair people, craft stalls, bands, street performers, street closure, insurance, lighting and clean-up to name a few. Hopefully next year the tradition returns. 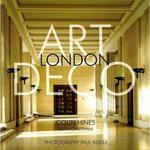 Art Deco London written by local resident Colin Hines with photographs by Paul Riddle and Keith Cheetham is the first ever guide book to the 20’s and 30’s deco delights of the capital. Its 60 pages contain 110 superb colour photographs and shows where in London magnificent examples of art deco can be found, eaten and quaffed in, slept in, shopped in, and campaigned for. Its deco delights range from ‘palaces of the people’ cinemas (many saved thanks to bingo), theatres, hotels, homes, shops, museums, a deco hospital and even a ‘decover and out’ crematorium. Currently running, there is a new joint exhibition featuring recent paintings by local artists, Idun Eustace and Jane Butcher. The show runs through 14 January 2007. Noel Josephides, the co-founder of Sunvil Holidays, based in Old Isleworth, Middlesex, has been awarded the British Guild of Travel Writers’ highest honour, the 2006 Lifetime Achievement Award in recognition of his contribution to the world of travel, which includes his pioneering campaign for ‘green’ tourism long before the concept was adopted by other sectors of the travel industry.